We have just received confirmation that our star guest for this weekends St Margarets Christmas Fair will be 00.7 himself Jason Bond aka Sean Canary. Sean will be arriving in his vintage Aston Martin Car and will be suitably dressed for the occasion. 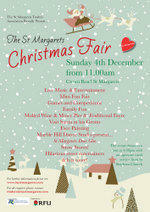 The St Margarets Christmas Fair - Sunday 4th December 2011 from 11.00am Crown Road St Margarets. The Occupy London protest is not the first to have upset the good people of St Paul’s. There were similar ructions in 1345. Then the dispute was not about anti-capitalism but about fruit and veg… and chickens. HANDS Caregroup are looking for a volunteer minibus driver (Midas trained) who is available once a fortnight on a Thursday between 12.00 and 17.00. They would need to collect the minibus from Richmond and Kingston Community Transport and then pick up 8 clients to take them shopping at Tesco, Mogden Lane and then take them home afterwards and drop the bus back to the depot. Small expenses are available. Regular Volunteer helpers/escorts would be available to support the clients and driver. Young and older poets from St Margaret’s and Twickenham were among the 22 shortlisted finalists for the inaugural Poems in the Park competition organised by The Friends of Richmond Park and Sheengate Publishing (publishers of The Richmond and Elmbridge and Kingston magazines). Late last month there was a devastating pollution incident on the River Crane that killed at least 10,000 fish and is likely to take several years to fully recover from. The Friends of the River Crane Environment (FORCE) is a local volunteer group that has been working to improve the Crane corridor for the last eight years and last Sunday the group held its first volunteer event since the pollution spill. Twickenham Film Studios have asked the council to consider removing the recycling bins from the council property adjacent to The Barons. The studios have decided that the bins are not suitable for outside their main reception area and request that they be moved as soon as possible. But where to? Do you have any suggestions as to where else in St Margarets that would make a good place for the recycling bins?